Easy to use, economical and portable. Constructed of heavy-duty malleable iron casting. 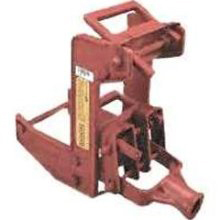 The Q2601 Wall Jacks are designed for use with 1.5" X 3.5" (2 X 4) fir poles. Capacity: When used in conjunction with poles made of clear straight-grained fir wood, free from all knots or defects, the Wall Jack has a capacity of 1,000 lbs. Click the button below to add the WALL JACK to your wish list.